I purchased this quilt at a local flea market last summer or the summer before. The woman said it was from the time of the civil war. The condition is not great in some spots and it looks like it's "been" through a war, but I'm just not sure of the time period. Does anyone have any information or thoughts on this quilt. I took pictures from a distance, of the backing and close-ups to help. The last 2 pictures are of the worst damage...one looks like a civil war cannon blew a hole through it!!! You can click on the pictures for more of a close-up. I absolutely love this quilt and all the wonderful colors. To think that if it is from that time period, that someone wore those clothes that those blocks were made from. Funny how I am drawn to so many different styles and colors of fabrics. I love civil war, 1930's, Thimbleberries, reds and aquas, brights...I love them all, that's my problem. I do not have a clue, but it it definitely a keeper! I don't have a clue either...are you going to fix it up? I don't know, there's no green which would help date it. Try to get a copy of Barbara Brackman's book on dating fabric and quilts. Or find a certified quilt apprasier. Well, do you want to maintain it's antique value or have it as a useable item in your home? I would first take it to someone like a "quilt historian" type person and have it authenticated and valued. Then, ask advice regarding restoration. No matter what you do with it, I'm sure you'll enjoy it!! Great find, but hard to tell how old it is. All I ever see in the shops are badly made ones from the 50's. 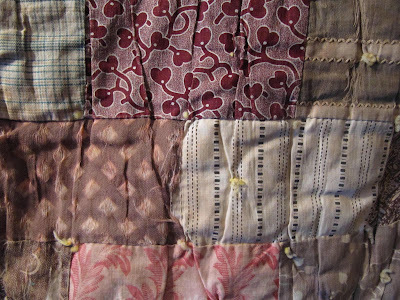 A couple of the fabrics look like ones I have seen in antique quilts. That is a great quilt...I, too, wonder about the fabrics and where they came from. I don't know anything about dating quilts, but I can see why you wanted it so badly! 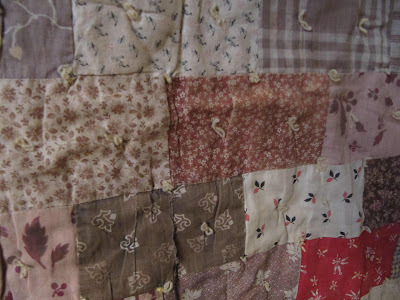 Hi Karen ~ I viewed a couple of actual Civil War quilts this summer that were on their way to a museum. They were absolutely gorgeous! 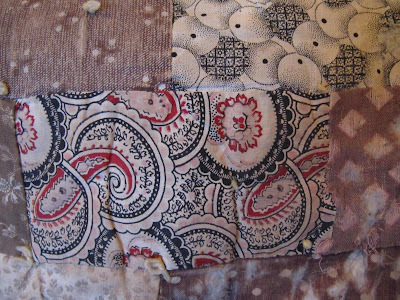 All I know is that I am in love with Civil War fabrics and have to have a little piece of what ever comes out. I am no authority on these prints but looking at your quilt up close I can see the prints are very similar and some almost exact to the reproduction fabrics that have been coming out in the last 10 years. 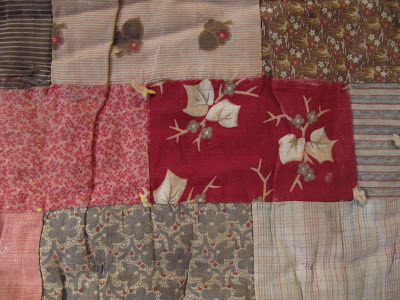 I truly believe....looking at the wear...that it is an actual Civil War quilt. If so...you have yourself a real treasure! The quilts that I saw this summer came from a family back in Virginia. 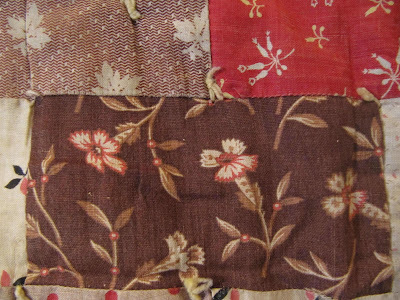 Those quilts also had similar...if not exact prints that we see in our reproductions we have today. 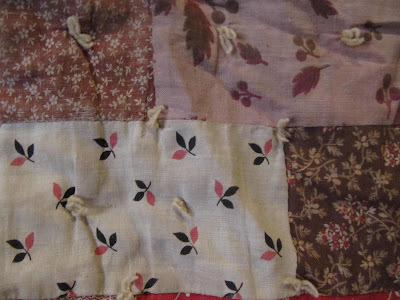 The family had one quilt that dated back to 1760 and William Bradford, which is my family line. Very exciting! The bed sheets and quilts are really very great. I wish i could purchase all these and present it to my wife ion her birthday. It's so beautiful, Karen! I'm afraid I cannot help you with the dating part either. finding the newest fabric in the quilt is how it would be dated...looks old from the picture not convinced civil war time though....late 1800's more like it. Did you buy it from an antique quilt collector? its a beauty and glad you bought it ! WOW! What a find - it's incredible!! 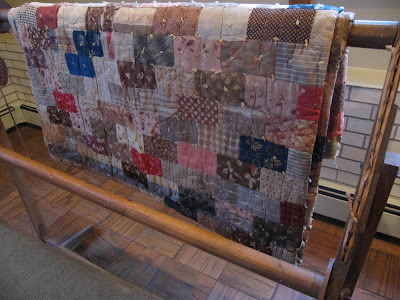 In my blog surfing, I've seen people who specialize in saving antique quilts - I can't think of anyone off hand, but the comment about contacting the American Quilt Society is probably where I would start. If I find the information I'm thinking of I will forward it to you. Good luck - really this is a beautiful find! Sorry I can't help with dating your quilt, but I like the fabrics too! It's gorgeous Karen. And that you love it is the important thing. My thoughts are the same as I have with my thrift store find. Make it acceptable to use, love it and display as you like and don't worry about anything else - just my opinion. I don't have a clue but it is gorgeous! I love it! In a quilt with so many fabrics you probably have a range of fabric dates. It looks to me from about the 1870-1890 time frame. Though hard to tell from the photos, if some of the reds are a burgundy/claret type red, those would tell you it was no earlier than 1890. The quilt looks lovely - mellow and cosy. Good luck with dating it and keep us posted! 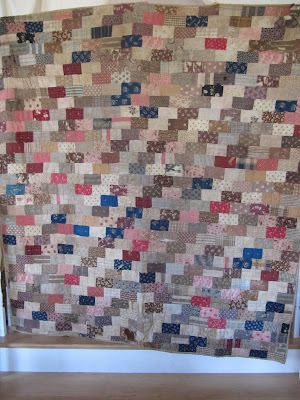 I'd say the 1860-1880 time frame would be right for your quilt? 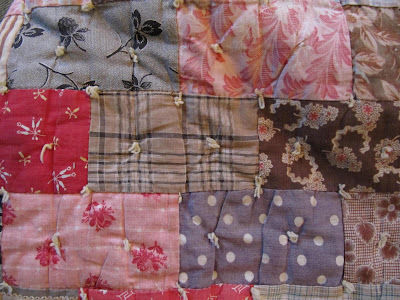 Like all scrappy type quilts there will be fabrics from a wide time span. The books I looked at had fabrics very similar in that time range. Be sure to keep it away from strong light..especially day light. 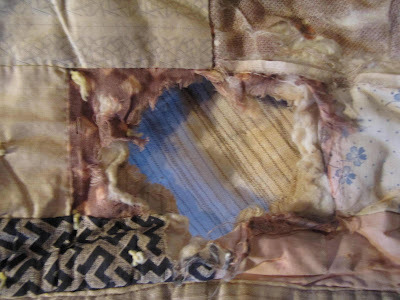 I learned a lot about restoring a damaged quilt when I did this first one. Please get in touch if you'd like to chat about that. Found your blog via Bejeweled Quilts by Barb -- thanks, Barb I'm a follower here now! I'm not an antique quilt collector (altho I LOVE them! ), so I'm no help with the fabrics. I did take a class and the quilt looked like this. She called it Stacked Bricks, but said it was known as a 'postcard' quilt. If I remember right, they thought that postcards were used as templates. Ours had diagonal rows of the same fabric. This one is lovely! Looks like the right time slot to me. All of my repros look like that...and those aren't reproductions!!! :o) The CW-1880's sounds right. What a wonderful find!!!! 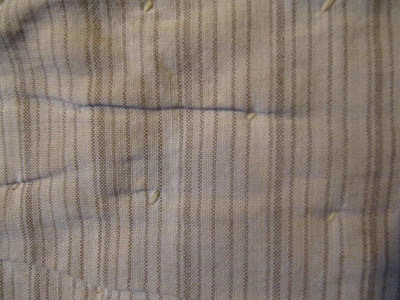 The dyes in the fabric used at this time were quite harsh and that is what has eaten up the fabrics. 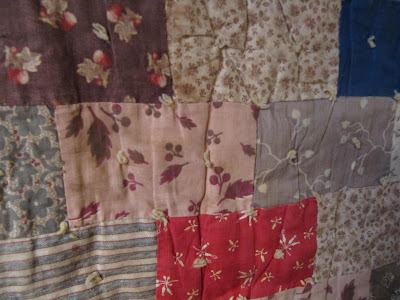 We have a quilt of similar age from my husband's aunts - and it has some fabrics completely destroyed like in your quilt. The browns and reds are in the worst shape. 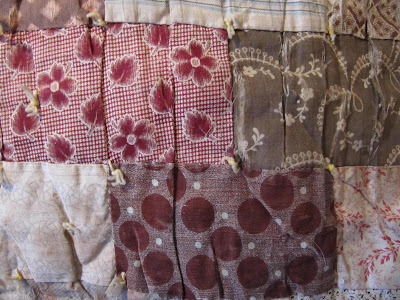 Isn't it fun to have such an old quilt? Just found your blog. Great stuff! I'm new to blogging since Feb. I live on a barrier island w/no bridges to mainland, stores, mail, nothing! So, thank GOD for the cell phone internet! YEAH! 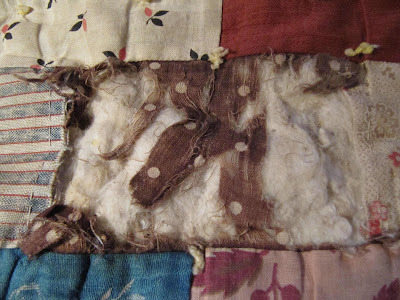 what a great find...the quilt contains a lot of fabrics one would expect to see in an 1860s quilt,and apart from one fabric I see nothing to suggest it wouldn't be 1860s. 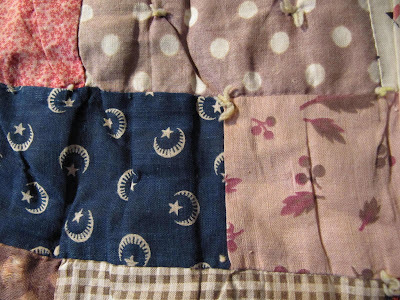 However even that fabric I may not be seeing correctly (bit hard to tell just by a photo)...it's a dark blue crescent moon and star, now it looks a bit 'cadet blue' in which case they were used from 1880 but of course it may be a faded indigo in which case that would be right for the rest of the quilt. It looks like you've got a few Prussian Blues (1840-1860s). 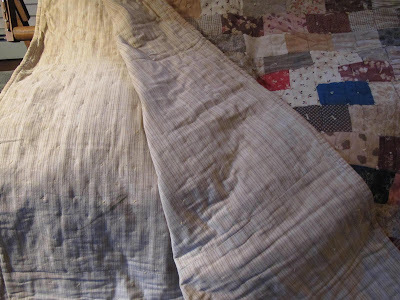 The condition is fair/average for an 1860s utilitarian quilt, that is made quickly to be used and washed, from scraps and tied...as opposed to the 'best quilts' from the 1800s which only went on a bed when a favourite maiden aunt came to visit and can still be seen today in pristine condition, never been washed. 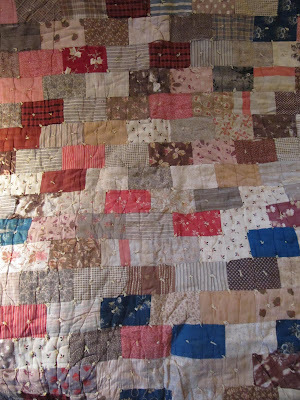 So nothing is ever 100% certain, unless of course it's dated (and so far I've not seen an antique utilitarian quilt dated)but IMHO I think you have a fabulous find there, and you love it which is the most important reason for buying an antique quilt. 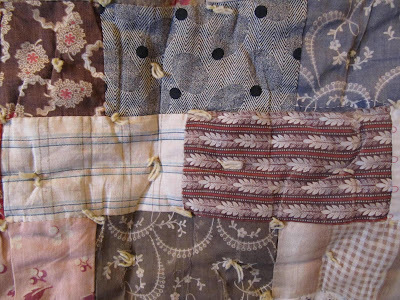 I have had the privilege of seeing scores (100 maybe) of American 1800s and early 1900s quilts over 10 years quilt study here in Australia by an American collector and historian who now lives in the same state as me, I'll take my laptop (so she can see your photo's)to the next study day (March) and get her expert opinion. ps- Love your blog especially Tool Time Tuesday posts, thanks for sharing! So What did you do with this quilt? I like it and now wonder how you choose to restore it.